PDR – Paintless Dent Repair / Painless Dent Removal – The act of reshaping a dented area without the need for conventional repairs. Paintless Dent Repair (PDR) is the process of removing minor dings or dents in the body of a car without doing any damage to the paint, removing the need to repaint the vehicle. This saves the customer quite a bit of money, but if there is already damage to the paint of a vehicle, PDR may not be the best solution. A lot of times people attempting to do paintless dent repair (PDR) end up damaging the paint of their car. This damage generally makes it even more expensive. This is why it is definitely best to leave PDR to the professionals. There are a few methods of paintless dent repair (also referred to as paintless dent removal.) The first method of repairing these dents or dings on your vehicle is done by taking a metal rod and pushing the dent out from the underside of the panel. Since this is done from inside the paneling, there is absolutely no damage to the paint on the outside of your vehicle when performed correctly, but for some dings this will not work. Limited access or depth of the dent are a couple of factors that prevent using a dent tool behind the panel. The second method of paintless dent removal involves taking a strong adhesive (usually a special type of hot melt glue) and pressing it to the dent in the car. The technician then takes a type of pulling system to pull the dent out from the outside of the car. This could be a slide hammer or a mini lifter. 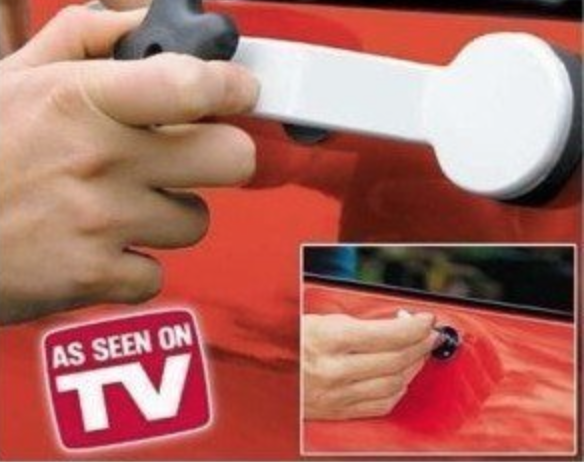 Although this method will generally remove the dent, it does come with the danger of damaging the paint. Non-factory paint (repainted by a body shop) may pull completely off the vehicle. Some paints may leave ring marks from the heat of the glue. Many of the newer models of cars have an outer layer on the paint known as a clear coat which helps minimize the chance of this method damaging your paint. There are plenty of products advertised to perform paintless dent removal on your own, and although some of these products may work, it is possible to cause the outer coat of paint on your vehicle to begin peeling. Many of these as seen on TV type products are flawed in their design. The bridge type for example has 2 feet to hold the puller against the car with a middle attachment to pull the dent. The problem here is that as the dent is pulling out, the feet are causing 2 new dents. 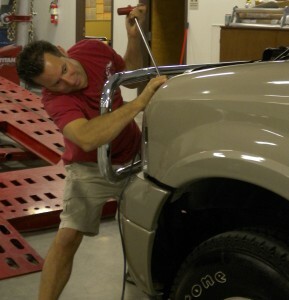 For those without the money to take your car to a body shop or a PDR company to have PDR performed, these methods may be suitable for you, but if you can afford the extra money, having it done professionally will cost you much less in the long run, since a new coat of paint for your vehicle is much more taxing on your checkbook than PDR by a professional is. For those still interested in performing PDR at home, research the product you intend to buy first! The World Hail Network completely advises against trying to remove dents yourself. It takes years to learn this trade and very few dent technicians reach a level of skill required to remove dents without a trace. We advise you to find a qualified PDR Professional here or elsewhere. Read about the next term: PARS – A large hail broker based in Colorado.